Colors provide us with valuable insights into our life’s experiences. Knowledge of the significance of the colors in our dreams is a wonderful tool for understanding the messages and meaning our dreams. Color meanings in dreams can be very telling about what’s going on in the deepest waters that stir within us. If you’re reading this page, odds are you have a genuine curiosity and interest in dream meanings. You’ve likely already got a good grip on the concept of dreams reflecting deeper meaning in your life experience. Your dream meanings are unique to you. No one can accurately pin-point the deeper message of a dream but you. Dreams are intensely personal – it only makes sense that you are your best interpreter. Using color to interpret and understand our dreams has been utilized for thousands of years in cultures with esoteric traditions. In human history, color was believed to be one of the most important symbols in the world. The mystical and profound meanings of each color were an integral part of all ancient civilizations who explored dreams and their meanings. Today, modern scientists and psychologists are recognizing and acknowledging the beneficial uses of color for therapeutic and medicinal purposes. Researchers have discovered that specific colors trigger the same responses in people, regardless of their culture or background. Even though we may not be consciously aware of it, we acknowledge the energy and power of the colors in our lives, and this is often reflected in our dreams and dream imagery and symbol. Color plays an important role in every area of our lives. Color has much symbol and imagery and represents our emotional states and conditions which are stimulated in our dreams. Color combines with symbol and imagery to form a meaning or interpretation of the dream image and adds a greater emotional significance. The color that is assigned to the dream imagery adds meaning and depth. Some dreams may be perceived as colorless due to the dreamer’s sense of recall. Color recall may also be associated with emotional attachments and memories. Color plays an integral and important role in everyone’s lives and provides us with valuable insight into our experiences through our dreams. Colors appear in our dreams in many ways. Sometimes an image can be vibrant or partial, or entirely in the natural colors of our world, such as sky blue, brown and green tones. The clearer the color, the more accurate and clear the meaning and message. The muddier the color, the more that particular area (or emotion) is blocked for you. Some people recall having only black and white dreams or with pale, insipid neutral shades. Research has shown that the majority of our dreams (70% to 83%) are in color. 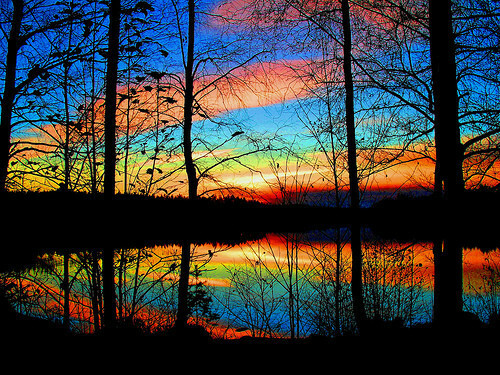 Vivid colors are usually associated with lucid dreams and dreaming. Knowledge of the significance of the colors in our dreams is a most effective tool for understanding and interpreting our dreams. Dreaming of certain colors in your dreams can have great significance when it comes to unlocking what a dream means. Since we are affected by color in waking life (we often associate color with emotions and moods) – it only therefore makes sense that our dreams also use color to help guide us and help us understand ourselves better. Now, before we go over what all the different colors often mean, it is important to remember that colors in dreams can have many different meanings, and they will vary from person to person. Someone who is fond of the color yellow will think much differently than someone who hates the color yellow. So while these meanings below will give you a good start on interpreting your own dream colors, bear in mind you are the best interpreter of your dreams. BEIGE – The color beige appearing in dreams represents the basics, the essentials of life, the barest form or ‘bare bones’. Beige presenting in your dream may indicate a neutral or unbiased view or position on a matter or in a situation. BLACK – Black is the color of the unconscious, mystery, change and protection. It resonates with indifference, gloom, death, darkness, obscurity and secrecy. Black is often associated with death or major changes. Seeing black in your dream may represent the death of old ideas and/or the endings of a situation or phase in your life. Seeing the color black in your dreams may also suggest a hidden or rejected aspect of yourself. Black can symbolize the unconscious, hidden things, the unknown and endings. Black appearing in dreams invites us to delve deeply in the subconscious mind in order to gain a better understanding of the ‘Self’. Black appearing in your dreams may be representing potentials and possibilities and may be symbolic of a ‘clean slate’ or ‘blank slate’. Within the context of the dream theme, seeing black can suggest Divine qualities and heightening spirituality. Black is the darkest of all colors and to dream of black can have a number of different meanings. It is often a color associated with loneliness, sadness, emptiness, mourning, and depression. It can often signify the unknown or mysteriousness. Black can also mean hatred, fear, anger, and darkness. BLACK & WHITE – To dream in black and white can suggest that you need to be more objective in formulating your choices and decisions. It may imply that you are too rigid and/or unyielding in your thought processes and may need to find balance and a place of reference. Consider the opinions and views of others to gain perspective. Dreaming in black and white may be a sign of sadness, melancholy and/or depression. You may feel as though there is not enough excitement, variety or color in your life. Dreaming in black and white indicates a heavy reliance on structure, uniformity and order. Black and white dreams point to a distinct separation between reality and fantasy. Some of my colleagues encourage integration of right and left-mind behaviors when they learn their clients dream only in black and white. I’m not sure I agree. I’m more inclined to explore the shadows, and values in the black and white and mine the meaning from that landscape rather than learn another method of dream expression. Black and white dreams can offer crystalline perspectives. They offer fewer distractions so the purity of meaning can be more easily sought. Furthermore, black and white dreams offer a crisp, clean beauty that is incredibly remarkable to the exploring mind. I notice I have black and white dreams when my inner awareness needs me to recognize the facts about the situation. No fluff, no baloney. Black and white dreams give me a “newspaper” understanding of the events playing out in my present life. They are extremely easy for me to interpret. Straight forward, chronological, and orderly. These are just some thoughts wrought from my own dream-color experiences. BLUE – The color blue vibrates with the energies of wisdom, truth, heaven, devotion, eternity, tranquility, loyalty, openness, receptivity and loyalty. Seeing blue in your dreams may suggest a feeling, need or desire to get away from a situation. Blue in your dreams may symbolize your Spirit Guide (or a higher spiritual beings) guiding you. The color blue appearing in dreams may symbolize your Spirit Guide and Divine life path and soul mission. It also suggests clarity of mind and optimism for the future. Alternatively, dreaming of blue may be suggesting ‘being blue’ or ‘feeling blue’. Blue can also suggest optimism about the future and suggests clarity of mind. Alternatively, the color blue may be a metaphor for ‘feeling blue’ or ‘being blue’. Wearing light blue in your dreams symbolizes your personal creativity and suggests that you are a person who likes to pace yourself in all that you do in your waking life. The color blue is a conceptual color that urges us to seek our inner-truths. When blue appears in your dreams it helps you to attain inner-peace and harmony, mental security and a desire for deeper understanding. Blue is stimulating to our spiritual security. If there is a long of blue in your dream it allows for composure, patience, gentleness and contentment. Navy blue can be seen as a rigid or stoic color and seen in dreams, navy blue can represent lack of individuality and conformity. The color blue appearing in dreams inspires: love, kindness and compassion, wisdom, gentleness, patience, forgiveness, healing, contemplation and sensitivity. Seeing blue in your dreams releases: fear and anxiety, self-pity, self-rejection, worry, depression and detachment, passivity, coldness and isolation. Blue is a cool, often tranquil and peaceful color. We often see blue associated with water, heaven, and the sky. It can signify a flowing of ideas/thoughts, creativity, calming, loyalty, honesty, and soothing feelings, or relaxation. Blue can sometimes also mean sad and depressed (feeling blue). If I suspended judgment, how would I describe my environment? What’s my ideal of tranquility? How can I more effectively communicate what I’m feeling? Am I aware of my own immortality? What’s my idea of “flying high” and how can I connect with that feeling more often? What ideas can I share that can potentially change the world for the better? BROWN – Brown resonates with the introverted, concealment (as in identity), sensation and material items. The color brown denotes practicality, domestic bliss, worldliness, conservatism and being ‘down to earth’. Seeing brown in your dreams may be suggesting that you get ‘back to basics’. Brown is an earthy color that we often associate with dirt, stone, and wood. To dream of the color brown often means you need to be “grounded” or need to go back to the origin of a problem. Brown can mean friendliness, trustworthiness, and wholesomeness (think whole grain bread). Since brown is a darker shade of orange, it can also mean a dulled sense of hopefulness and adventure. Light brown or beige can mean neutrality or predictability. BURGUNDY – The color burgundy appearing in dreams can symbolize success, wealth, abundance and prosperity. Dreaming of burgundy can be indicative of your personal power and potential. FUCHSIA – The color fuchsia represents your connection to your spirituality and emotional stability. Dreaming of fuchsia may suggest the letting go of the ‘old’ to allow in the ‘new’. GOLD – Gold represent the Sun, the royal way and spiritual enlightenment. Spiritually, the color gold reflects richness, refinement, rewards and enhancement. Dreaming of the color gold can signify your determined nature and ability to connect with the spiritual and angelic realms for guidance and support. GREEN – Green symbolizes growth, positive change, healing and peace. Seeing green in your dream may suggest or symbolize your efforts to establish your independence or gain personal recognition. Green resonates with natural life, vigor, growth, hope, good health, healing and balance and when appearing in dreams symbolizes and stimulates feelings of love, harmony, peace and personal growth. Green seen within a dream is beneficial for healing any deep brooding feelings of regret and/or remorse. Green appearing in dreams helps with overcoming and limiting attachments. Green energy is very healing on feelings of self-doubt and insecurity. Overall, the color green is a very healing energy and vibration to experience in your dreams. The color green signifies positive changes, growth and fertility, peace and serenity. Dreaming of the color green may be giving you the ‘green light’, implying that you are to go ahead with current plans. Seeing green in your dreams can be implying that you are inexperienced or lack experience is some way. Green appearing in your dreams may be symbolic of your ambitions and establishing your own independence. Green appearing in your dreams may be suggesting that there is a need to balance your masculine and feminine aspects and attributes. The color green can be symbolic of money and wealth and is also the color of envy and jealousy, depending upon the tone or theme of the dream. Dark green can indicate materialistic tendencies, deceit and difficulties with sharing. Olive green symbolizes natural inner-wisdom and ‘Zen’. Appearing in a dream, the color olive green may be suggesting that you need to achieve peace in your environment in order to gain equilibrium. Seeing green in your dreams inspires: generosity, vitality, power, expansion, encouragement, open-heartedness, a need to nurture, compassion and empathy, sharing, harmony, balance and growth. Green is another cool color that can signify peace and tranquility. Green is a color of healing and hope. Green can often mean “go”, such as power on button or a traffic light. Green can symbolize newness and freshness. It can also symbolize money, wealth, riches, and prosperity. Green appearing in dreams releases: possessiveness and jealousy, selfish attachment, envy, insecurity, mistrust and self-doubt. If your life were a lawn, what would it look like? How could you improve you lawn’s health, appearance, longevity? How am I communicating my love to others effectively? Am I aware of my own needs and meeting them? What other methods of communication can I develop? What if wellness was programmed in my DNA? How can I tap into that inherent health? GREY – Grey often symbolizes a lack of clarity and feeling confused, but alternatively, also symbolizes deep inner-wisdom. Seeing the color grey in a dream may suggest being emotionally detached to something, a situation or someone. It may also indicate feelings of fear, depression, confusion or ill-health. The color grey indicates depression, fear and fright, ill-health, confusion and ambivalence. Dreaming of grey may be indicating that you are feeling isolated, detached and/or emotionally distant. The color grey, when appearing in your dreams, may be symbolizing your individualism. Gray, a mixture of white and black, is a neutral color. It can mean indecision, uncertainty, or confusion. It may mean isolation or detachment. It may also mean lifeless or dull. INDIGO – Indigo is the color of heightened spirituality and Divine guidance and protection. How far can I move into my deepest presence/awareness/consciousness? How fully can I trust in the things I see with non-physical eyes? What are my beliefs around extrasensory perception? What’s my viewpoint on reality? How can I shift that if I want? What purpose do my dreams and visions serve? IVORY – Ivory seen in dreams can sometimes suggest a superiority complex and feelings of being ‘better’ than others. MAGENTA – Magenta represents compassion, thoughtfulness and kindness. Seeing magenta in your dreams may be a sign that you are stepping out of a dark time into brighter, happier ones. MAUVE – To see the color mauve in your dreams is a sign or message that you are to clear away any negative thoughts and energies and adopt a positive and optimistic attitude and mind-set. MAROON –The color maroon represents courage and bravery, heroism and inner-strength. Seeing it in your dreams may suggest an upcoming event or situation that will challenge you on many levels. ORANGE –Orange symbolizes friendliness and sociability. Seeing orange in a dream may be showing you knew interests and/or things that you are comfortable with. It may also suggest that you are leaning towards taking up a new interest or project. The color orange implies occult power as well as passion, courage and achievement. Orange in a dream corresponds with warmth and stimulation and is a happy, joyous color. Seeing orange in a dream stimulates expansiveness, optimism and emotional balance. Orange seen in a dream often suggests ambition and exploration, enthusiasm and self-motivation. If you are someone who has a tendency to be mistrusting or suspicious, or if you are seeking more personal power, seeing orange in a dream can assist in creating balance, discernment and discrimination. The healing, yet stimulating effects of the color orange, when appearing in a dream, may stimulate inner-knowing and enhances intuition. The color orange denotes friendliness, hope, courtesy, sociability, liveliness and exuberance. Orange also stimulates all of our senses. Seeing orange in your dreams may be a message that you desire to broaden your horizons. It is time to look to new interests and attractions. The color orange appearing in your dreams inspires: enthusiasm and optimism, courage, victory, confidence, encouragement, abundant supply, attraction, kindness and expansion. Seeing orange in dreams releases: mistrust, a superiority complex, power-seeking pride and superficiality. Orange is a fun, bright and bold color and often symbolizes hope, freshness, zest, vigor, and optimism. Orange is a stimulating color that can be a symbol for hunger, desire, creativity, or sociability. Orange makes you feel alive and well and on top of the world. What needs balancing in your life? How can I temper my obsessions yet still remain creatively productive? What kind of results are my actions, over time, going to yield? Am I approaching my life in a creative way? How can I incorporate more creativity and play in my daily life? What’s my idea of satisfaction, contentment, completion? PEACH – The color peach represents love, wisdom and innocence. Dreaming of peaches or peach colored items may be pointing out your nurturing and caring nature, and is a prompt to put them to good use. PINK – Pink is the color of love, happiness and joy, kindness and affection. Dreaming of pink can imply falling in love or being in love and the associated emotions. Disliking the color pink, and seeing it in your dreams may be implying problems to do with your parents (predominantly with the mother figure or maternal side) and/or dependency issues. Pink is a lighter shade of red, and can be a symbol of romance, love, sharing, generosity, kindness, affection, protection, and innocence. It can also be a symbolism of notice/observation. PURPLE – Purple resonates with power and inspiration. The color purple is most deeply associated with dreams and dreaming. Listen carefully and take special notice of dreams containing purple, indigo and violet. Seeing purple in our dreams stimulate our need to feel at one with the Universe, and to have harmonious relationships. Purple has soothing, calming and comforting effects and seeing purple in a dream may indicate psychic awareness and intuition. When seeing purple in a dream you may be seeing the future as these dreams are often prophetic. Purple stimulates our spiritual perspective and intuition. Purple is the color of devotion, Divine healing and healing abilities, love, kindness, compassion and care. Purple is also the color or royalty, justice, wealth, dignity and integrity. Dreaming of purple may be implying that your spiritual side needs to be explored and expanded. Trust your intuition, always. Take special note of dreams with a prevalence of the color purple. Purple appearing in your dreams inspires: inspiration and vision, faith and trust in the future, sensitivity to the spiritual realms and psychic abilities. Seeing purple in your dreams releases: confusion (brings clarity), lack of discipline, resentment and contempt, arrogance, pride and forgetfulness. Purple: Purple, the combination of blue and red, is considered to be a very spiritual and majestic color. It is sometimes associated with royalty and good judgment. Purple is a very creative and inspiring color and possesses a mixture of passion with calmness. Violet, a lighter shade of purple, can mean delicate, precious, or highly regarded. Shades of deep/dark purple may represent moodiness. RAINBOW COLOURS – A rainbow appearing in a dream denotes blessings from the heavens, and often represents the 7 main Chakras of the human body being open and operating at their optimum or is in the process of being cleared and/or healed. Dreaming of a rainbow or rainbow colors may suggest a pact or agreement, a promise or solemn oath. A rainbow always suggests a bright, or brighter, future. RED – Red can symbolize courage, passion and emotional relationships. Red is also the color of danger. Red represents energy and vitality, action, fire, blood, anger, wine and powerful sexuality. When seeing red in your dream you may wish to consider what your personal associations are with the colour red to decipher whether it symbolizes love and passion, or caution and danger. Seeing a predominance of red, or a distinctive object or symbol in red indicates energy and reaction as well as passion and anger. A clear red in a dream can symbolize pure anger. A muddy or murky red may suggest repressed and/or suppressed anger. Red in your dream may represent aggression, sensation and physical strength. Having red appear in a dream can be revitalizing and stimulating, motivating action. Red vibrates with raw energy, intense passion, aggression, courage, power and impulsiveness. The color red has deep spiritual and emotional connotations and stimulates all of our senses. The phrase ‘seeing red’ suggests anger, and seeing it in a dream can suggest unresolved issues. Appearing in a dream, red may be implying that you need to stop and think about your actions, and consequent re-actions. If you are a person inclined to dwell in the past, seeing red in your dreams helps to bring you into the present moment. Seeing the color red in dreams inspires: determination, honor, willpower, freedom, activity, strength, independence, initiative, leadership, passion, energy, anger and motivation. Red appearing in a dream releases: anger and frustration, confusion, destructive feelings, revenge, rebellion, impatience and impulsiveness. Red can mean many different things to different people, so when interpreting a dream with the color red, it is important you think about the context of the color in the dream and in connection with your waking life. For some it may mean love, romance, passion, lust, desire, and intimacy. For others it may mean anger or violence or to control and over power. Dreaming of red can also be a warning (ever hear the expression, raised a red flag?) or a sign to stop (think traffic lights and stop signs). SILVER – The color silver is symbolic of protective energies and represents justice and purity. TEAL – The color teal signifies devotion, healing and trustworthiness. Teal also signifies spiritual guidance and spiritual teachings. TURQUOISE – The color turquoise is symbolic of karma, natural energies and healing power and abilities. Teal is associated with the Sun, fire and masculine energies. Depending upon the context or theme of the dream, seeing teal may indicate that you are shutting off your emotions and not allowing others in. It may also suggest that you fear upcoming changes in your life. VIOLET – Violet is the highest spiritual color and seeing brighter shades helps to inspire and stimulate us and opens the channel for communicating with the angelic and spiritual realms. The cooler violet represents high spirituality, purification, affection, gentleness, charm and peacefulness. Dreaming of violet urges you to listen to your intuitive urgings and prompts as they are leading you along your Divine life path and soul purpose. Seeing darker shades of violet in your dreams may suggest a person who feels as though they have many obstacles to overcome and/or feeling misunderstood. Listen carefully and take special notice of dreams containing violet, indigo and purple. WHITE – White is often regarded as the color of truth and purity, innocence and completeness. The color white is symbolic of perfection, peace, dignity, awareness and new beginnings. Dreaming of white may be implying that you are experiencing a reawakening and/or a fresh outlook on life. Seeing white in your dreams may also be a suggestion that something is being covered-up or hidden; as in ‘white-washed’. White appearing in your dreams can also be indicative of a ‘clean slate’ or ‘blank canvases on which to begin or start anew. Seeing white in your dreams may be a subconscious message to find the truth to a matter or situation, or to seek your own personal truths. Seeing white within a dream relates to the imagination, and its effects on us stimulates creativity, Divine realization and humility. When appearing in dreams leads us towards higher spiritual attunement and Divine love. Dreaming of white can be a great healing color for a person with a negative self-image as white has the power of transformation. Seeing white in our dreams inspires: Intuition, creativity, Divine guidance, meditation, reflection, inner-wisdom, grace and dignity and spiritual unity. White appearing in dreams releases: restrictions, intolerance, martyrdom, a critical and/or negative view. White is the opposite of black. It signifies love, acceptance, purity, peace, knowledge and brightness. While white usually has positive connotations, it can sometimes have a negative meaning, as white is a color of mourning in Eastern cultures. There are also many sayings and phrases that use the color white that may be applied to your dream, such as “white out” and “white wash”, which mean to cover up/conceal. YELLOW – The color yellow carries both positive and negative connotations, depending upon the theme or context of the dream. Positively, seeing yellow in a dream may suggest happiness and joy, agility, harmony, wisdom, energy and the intellect. If the dream is unpleasant in nature, seeing yellow can represent disgrace, deceit, disgrace, betrayal, cowardice and illness or sickness. Seeing yellow in your dreams may suggest a fear or inability to make a choice or decision, or to take necessary action/s. It may be implying that your desire to please others is making you at risk of sacrificing your own needs and inner-happiness. As a result, challenges and set-backs may appear in your life. To dream of being in a yellow room suggests that you are to utilize your intuition, personal creativity and initiative to get things done. It tells of mental stimulation. Yellow symbolizes the intellect, energy, inner-wisdom and happiness. Seeing yellow in a pleasant and/or happy dream can suggest the intuition and intuitive messages that foretell of blessings and glad tidings. In an unpleasant or sad dream, seeing yellow may suggest sickness to come, or cowardice in a real life situation. Yellow represents the extrovert and an extroverted personality, mental power and agility, determination, and negatively, cowardice. Seeing yellow in a dream relates to our intellectual thinking process and stimulates logical linear thinking. The color yellow stimulates left-brain activity, active intelligence, organization, attention to detail, evaluation, sincerity and harmony, praise, administration, heightened expression and personal freedom. When yellow appears in dreams it must often suggests happiness, inner-joy and blessings. Yellow is a color with various meanings, usually either positive or negative depending on the context of it being used in the dream. On the positive side it can mean innocence, hope, happiness, and lightheartedness – to have a “sunny disposition”. On the negative side it can mean indecision, cowardliness, or sickness. Pay careful attention to how the dream made you feel to understand the meaning of the color yellow in your dreams. The healing power of the color yellow, when appearing in dreams, works on both known and unknown fears. Yellow in your dreams will gradually release the tension from an accumulation of fearful experiences. Seeing yellow in a dream inspires: joy and optimism, expression, ability, attention to detail, active intelligence, evaluation, discipline, organization and administration. The color yellow appearing in dreams releases: constriction and restriction, sorrow, selfishness and selfish judgment, bitterness, cynicism and criticism. What perceived barriers do I have that prohibit my greatest view? What core belief do I express that puts me in the best advantage? How am I influencing others? What is my guiding light, and how can I remain illuminated? What can I do to gain more clarity? What steps can I take to nurture my creative awareness? Understanding the energy and vibration of color understands the essence of energy. If You Remember a Color, It’s Probably Important: If you remember that something is a certain color, it’s probably important. After all, we don’t really go through our day to day lives and identify the color of every object we come into contact with. So if you dream of an object that is a certain color, don’t dismiss it – that color very might well be tied to the greater message of the dream. Look for Color Combinations: Often times we’ll see color combinations. For example, maybe you dream of a yellow and blue bird. This might mean that you feel at peace and happiness, or it could mean you feel cowardly and depressed. When you tie two colors together, it can help you greater understand the meaning of the dream. Consider Your Personal Relationship With the Color: If you’re favorite color is hot pink, and you dream about it, that would mean something different to you than if you dream about yellow, you’re least favorite color. Think carefully about your relationship with that color. Do you like it? How does it make you feel? What experiences in life have you had with that color? Think About Color Names/Different Shades of Colors: There are thousands of colors and even more names for the basic colors, like turquoise, aqua, fuchsia, burgundy, olive, maroon, crimson, ivory…the list goes on and on. If you happen to have a color like that in your dream, consider whether the name has any significance – then think about the shade. For example, turquoise is a shade of blue green. As you can guess, it has qualities of both blue and green. Burgundy is a deep, dull red color – which could signify a dulled passion or love interest for example.